Civil Engineering student selected for BYJU’s The Learning App at a package of Rs 7 lacs per annum. 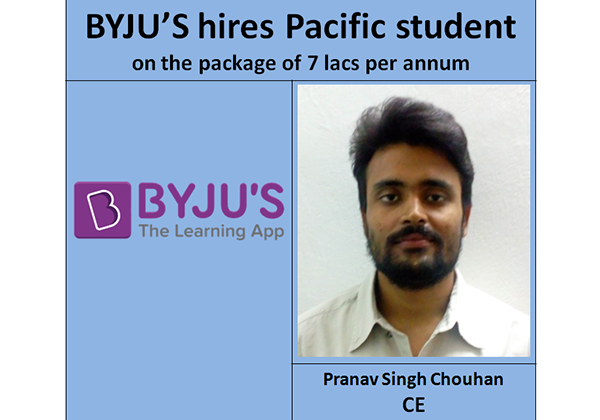 Congratulations to Pranav Singh Chouhan, Civil Engineering Student, for selection in Byju’s, The Learning app at a package of Rs 7 Lacs per annum. http://www.pacific-it.ac.in/wp-content/uploads/2018/03/3.png 420 600 nirbhay http://www.pacific-it.ac.in/wp-content/uploads/2017/06/PIT-black-resize-1-min.png nirbhay2017-11-08 11:18:102018-05-23 11:08:38Civil Engineering student selected for BYJU's The Learning App at a package of Rs 7 lacs per annum. Seminar on Recent Trends in Energy Conservation by Prof. Dr. D.P. Kothari, Former... Pre-placement Workshop organized by Faculty of Engineering.